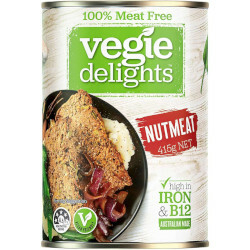 Nutmeat can add great healthy flavour and texture to many different meals. It is a great source of protein, iron, zinc and vitamin B12. It contains no artificial colours or preservatives and is cholesterol free. Water, Wheat Gluten (23%), Peanuts (20%), Onion, Salt, Minerals (Zinc, Iron), Vitamin B12. I'm so happy I have found somewhere that sells Nutmeat in the UK! I love it! I use it to make tasty tasty burgers. Slice and shallow fry the nutmeat, serve on a nice burger bun with fresh salad. Its best with grated beetroot, carrot, tomato and cheddar cheese with a touch of chili sauce. Yum yum! This is such a versatile product, it is not good to eat on its own though it is bearable. It makes the best casserole with vegies and gravy and you can mash it or cube it or make it into patties. Worth a try and look up the recipes on the internet.